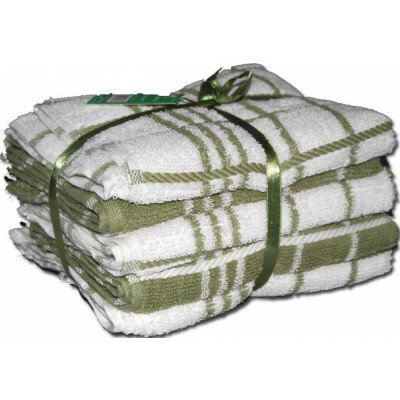 Made from lavish 100% cotton, this soft Green Terry Kitchen Towels in a Pack of 5 will provide upmost luxury and softness making it the ideal choice for you to use it. Its Simple design with a stunning striped pattern will help you create a co-ordinated look with ease. Easy to wash and dry, this Terry kitchen towel is highly durable and resilient. Bedding Mill offers high quality hand towels, face towels and bath towels that will surely revamp the decor of your bathroom and that too in a very economical way. Our sumptuously soft Towels are present in ample of designs, colours, and prints to complement any type of bathroom, be it modern or traditional. Our lavish bath and hand towels will surely give you a luxurious feel. Our towels are made from supreme quality material and are very soft and smooth with high absorbing power. Our quality hand towels, bath towels and face towels are machine washable and can be tumble dry. Available in choices of sizes, you can easily pick the one most suitable for you.